Public Highlights Tours Will be offered on Saturdays at 2PM. There will be NO PUBLIC TOUR Saturday March 9th. Audio Guides are Available for our exhibition Timely and Timless: Japan's Modern Transformation in Woodblock Prints. See the front desk for details, or go directly to our APP. 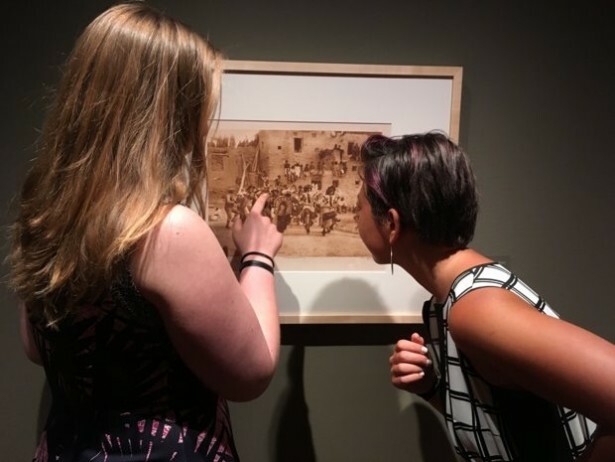 Highlights Tours are given by Museum Educators and Dickinson College Students studying current exhibitions and museum education practices. Tours last approximately 40 minutes and are designed as interactive conversations. Please share specific interests with your guide at the beginning of the tour to ensure a tailored experience. If you plan to bring a group of twenty or more people to The Gallery for a highlights tour, we kindly request that you make a separate reservation for your group. Group tours are free of charge. To make a reservation, contact Heather Flaherty, Curator of Education at flaherth@dickinson.edu or 717-245-1492.